Cats are strong willed creatures who love to explore their surroundings. Unfortunately, this can lead to them needing rescuing from unusual places. Getting the right balance between letting your kitty explore their environment and keeping them safe from harm can be tricky, but that is where a cat harness can help. But, with so many types and styles on the market, how do you know which harness to choose. Our panel of cat experts and pet lovers have put together a list of the 8 best cat harnesses to help you make the right decision for you and your furry feline. 5. Voyager Soft Harness for Pets by Best Pet Supplies Inc. 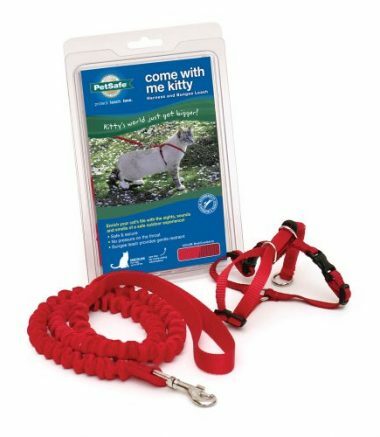 If you are looking for a safe and effective way of letting your at explore the outside world, then the Come with Me Kitty Harness and Bungee Leash from PetSafe is just what you are looking for. The harness is designed to cradle your cat and restrain forward motion when you apply gentle pressure via the leash. The cradling affect calms most cats, without putting pressure on their neck or throat area. The harness is adjustable, so it can be set to meet your cat’s specific shape and size. The shoulder straps move through the D-rings on the back so that you can increase pressure if needed, while the bungee leash provided softens the effect of your furry feline reaching the end of the leash. The No Pull Comfort Padded Vest by PACCOMFET is made from 100 percent polyester, covered with a breathable mesh. It enables you to have control over your feline’s movement without causing pain or discomfort. The over the head harness is durable and padded for extra comfort. It includes a single D-ring leash attachment point on the top of the harness and a single adjustable strap to ensure a good fit. The wrap around, vest style Escape Proof Car Harness with Leash by PUPTECK is perfect for cats who need a little extra support to stop them wiggling out of their harness. The harness is made from breathable air mesh fabric, which ensures your cat is comfortable whatever the weather. The vest has two closure points at the neck and around the chest. The neck point is secured with a plastic closure and Velcro strap, while the chest closure is a strong Velcro strap. The leash is made from strong nylon and attaches to the harness via two heavy D-rings on the back. The Cat Harness by Kitty Holster is a wraparound vest style harness made from 100 percent cotton. 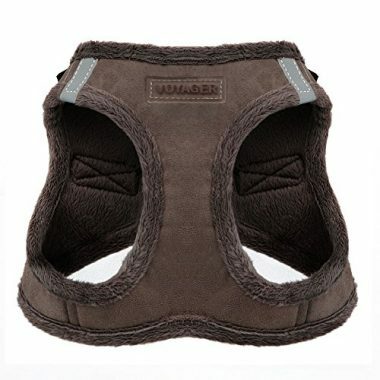 The harness is soft, breathable, and secured by two wide Velcro straps. The lining is made from undyed cotton and the harness is suitable for use in all weathers. The lightweight but strong harness has a single D-ring leash attachment point and can be washed to keep it in top condition. 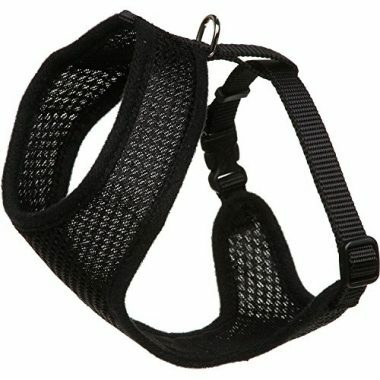 Voyager Soft Harness for Pets by Best Pet Supplies Inc. This super soft step in style harness provides safety and comfort for your cat. Made from super plush suede the Voyager Soft Harness for Pets by Best Pet Supplies Inc is easy to use and adjustable for the perfect fit. The no pull harness includes an extra strong Velcro strap and clip lock to keep the harness in place, and a double D-ring leash attachment point. The harness is ideal for winter walks and use in colder climates; it can be machine washed on a delicate cycle and then air dried to keep it in top condition. If you are looking for a comfortable harness that can double as a cat costume, then this set from Bro’Bear is just what you are looking for. 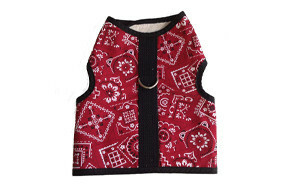 The fabric harness has a colorful fabric exterior and a mesh inside to keep your pet comfortable and safe. The harness allows you to walk your cat without the worry of them running off and without straining their neck. The harness evenly distributes pressure across the chest and comes complete with a matching leash. The step-in design secures with a Velcro strap and quick release clip buckle, while the leash connects via two D-rings. The Adjustable Cat Harness Nylon Strap Collar with Leash by PUPTECK is designed to fit small cats and young puppies under 12 lbs. The harness evenly distributes pressure and is adjustable for the perfect fit. The harness is easy to fit and secured with snap-lock buckles on both the front and rear body straps. The harness set comes complete with matching leash, which attaches to the harness via a single D-ring. 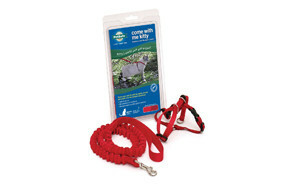 The simple, yet effective Mesh Cat Harness from Coastal Pet is ideal for use in any weather. The over the head design is easy to fit and secures with a quick release click lock buckle. The lower strap is adjustable so that it can fit most cats snuggly. The harness includes a single D-ring attachment point. Knowing more about the best cat harnesses that are available is only half the answer. It is also important to learn more about harnesses in general, how they should be fitted, and what to look for in a good harness. It is also important to consider what makes the best cat leash as a harness is often only as good as the leash that connects you to your cat. In this part of the buying guide we provide answers to these and other questions to help you buy the best possible cat harness for your needs. While harnesses may differ widely in appearance, material, and size, there are three main categories that they all fit into. These types are figure-8 harnesses, V-harnesses, and H-harnesses. This is a basic style of harness that consists of two circles that go around your cat’s neck and torso and attach at the back of your cat’s neck. The Figure-8 harness is often considered the best harness for those looking to walk their cat on a harness and leash as it tightens to apply gentle pressure as your cat moves. This makes it easier for owners to keep control and means your cat is a lot less likely to be able to slip out of the harness. These are vest style harnesses. They tend to wrap around your cat and secure at two points across the body, usually with Velcro straps, but often also with quick release buckles as well to provide additional security for your cat. This style of harness is preferred if your cat is going to be wearing it for long periods of time. The material it is made from is important as you cat could overheat in warmer months if the vest material is too heavy or not breathable. The H-harness is similar to the figure-8 harness, but it has an additional piece of material that runs between the two loops. This makes it look like the letter H when you look at your cat from the side. The H-harness helps to distribute pressure more evenly across your cat’s body if they pull. 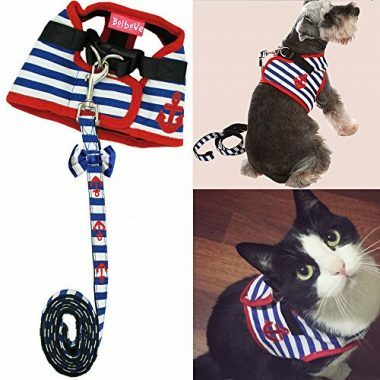 This helps to prevent injuries to your cat’s neck, particularly if they are young or prone to tugging on the leash. Buying a cat harness is not just about the type of harness you need, it is also about the material used, how easy it is to put on, and the safety features that are included. Here we look at these and other things you should look out for in a cat harness. This is especially important if you are taking your cat hiking or walking through environments where they could get muddy. If the harness cannot be washed, then it is likely to become uncomfortable for your cat to wear and could potentially become a breeding ground for bacteria. A machine washable harness will be easier to wash and is likely to dry quicker than one that needs to be hand washed. It may take a while for your cat to acclimatize to wearing a harness, so one that is simple to put on is essential. It is also likely to cause less stress to your cat. Look for safety features including quick release buckles and strong D-ring attachment points for the leash. If the leash is not included, then check that the leash you buy is suitable for use with the harness. The best cat leashes are designed to the same high standard and often include elastic – like a bungee rope, to provide some ‘give’ when your cat gets to the end of the leash length. Check that the harness distributes pressure evenly across the body and does not pull on or restrict their neck or throat. You want your cat harness to be effective and long lasting. Check aspects such as the stitching around the D-rings and closure points. 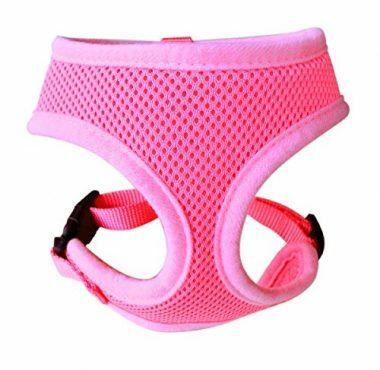 Also look for good finishing on the edges of the harness, if these begin to fray your cat could easily get caught in the loose threads or get them caught on things while you are out walking. It is crucial that you purchase the right size for your cat. If it is too small it could restrict their breathing and movement, too big and they could easily slip out of the harness or become tangled in it. The best cat harnesses are also adjustable so that they can be fitted exactly to the shape and size of the individual cat. The last thing you want is your cat overheating while they are wearing their harness. Unless you are in a cold climate or using the harness during the winter months, it is important to avoid heavy materials. 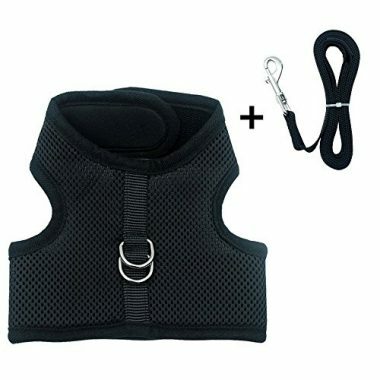 If using a vest style harness, then check that the material is breathable and includes padding to make it more comfortable. 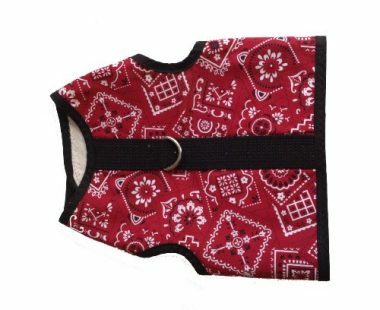 Nylon and cotton are both popular choices for harnesses, however for vest harnesses cotton is more likely to be comfortable and provide breathability. To avoid your cat slipping out of the harness you need to ensure that it does up securely. Most close with either Velcro or clip buckles, or a combination of both. Velcro strap should be wide enough not to dig into your cat and buckles should have a quick release feature, just in case you need to remove the harness quickly. Once you have found the perfect harness and leash, the next step is to get your cat used to it and this is a process that in most cases takes time. Start by introducing your cat to the harness by leaving it with their other toys and accessories. Being curious by nature, it should not take long for your cat to start investigating the harness. You can familiarize you cat with the harness by rubbing it on their kitty bed or blanket to place their smell on it and make it seem more familiar. The next step is to place treats near the harness to they begin to associate it with positive rewards. At this stage you can put the harness on your cat remembering lots of praise and treat. If they become stressed at any point stop, you don’t want them to associate it with negative experiences. Once you have managed to get the harness on the cat, let them wear it indoors to become accustomed to the feel of it. This is a good chance to check its fit and how your cat moves when wearing it. Do this for a few days, it also gives you the opportunity to practice putting it on and taking it off. Next, attach the leash and practice walking with your cat indoors. Start by being led by your cat before you take control of the direction of movement. Again, it is important to associate wearing the harness and leash with something positive, so plenty of praise and treats. Now you are ready to go outdoors. Start small and in familiar surroundings, especially if your cat is new to going outside. Build up the amount of time you are out slowly and introduce new experiences over that time. Always double check the fit before your head out and check the harness for signs of wear when you return. Q: How Do I Put on A Cat Harness? Making sure your cat is calm and comfortable before putting on the harness. You may want to sit them on your lap and give them a fuss before getting started. Ensure that you have the harness laid out the right way around to reduce the time it takes to put it on. Talk to your cat while placing the harness on them and remain calm, you can give them treats to distract them. If your cat shows signs of stress or agitation, stop and give it some time before you try again. Check the fit before you attach the leash. Experts suggest running your fingers between the harness and your cat. You should comfortably be able to get two fingers between your cat’s body and the harness. Attach the leash, check it is connected properly, and you are ready to go. Q: What is The Safest Harness Style? A: The most important thing to remember about your cat’s harness is that it should not put any pressure on their neck or throat This means that quality is more important that style. However, the specific style you should go for depends on the nature of your cat and the intended use of the harness. If you are looking to walk with your cat regularly, then experts generally agree that a figure-8 harness is the safest. This is because it gives you more control if your cat pulls. When this happens this style of harness tightens slightly, ensuring they cannot slip out of the harness without choking your cat. It is also important to look at the safety features of the harness. Those that are safest tend to have secure clip lock buckles to keep the harness in place and are adjustable to meet the needs of your cat. Q: How Can I Tell If the Harness is Too Tight? A: If the harness is too tight your cat will be uncomfortable, and their breathing and movement may be affected. To check the harness is fitted correctly place two fingers between the harness and your cat’s body. If you can slide your fingers between them, then the fit is correct. If your fingers are stuck or squashed, then the harness is too tight. 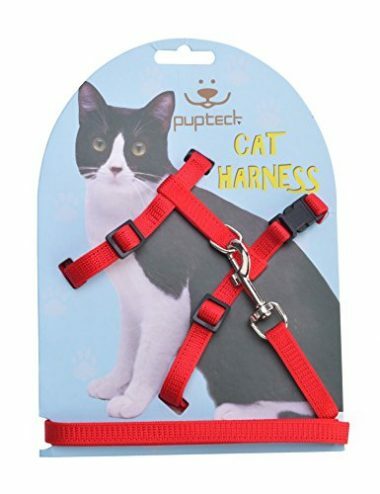 Similarly, if you can move your fingers too easily, or there is room for more of your hand, then the harness is too loose, and you risk your cat slipping out. By choosing the best cat harness from our list and following our detailed buying guide you can be assured that you will find a harness that your cat will grow to love. They gain additional freedom and stimulation, while you get peace of mind knowing they are safe and secure.